(Newser) – You'll never look at a Cessna the same way: The Washington Post delves into a new surveillance technology that can track any person or vehicle across a small city for hours via 12 192-megapixel cameras mounted on an aircraft. Though people appear as dark specks on a gray background and faces and details are impossible to make out, the system shows crimes as they develop, and their aftermath; in one case, images showed a group assembling, a shooter approaching his target, and a body hitting the ground. What it also showed: the hideout where the shooter fled. The system costs less than police helicopters—about $1,500 to $2,000 per hour—and it could drive a precipitous drop in crime, says Ross McNutt, president of Persistent Surveillance Systems. 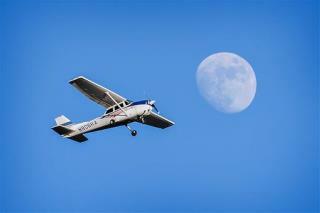 He guesses his cameras would spot up to 50 crimes during a six-hour flight over Washington, DC. "We watch 25 square miles, so you see lots of crimes," he says. "And by the way, after people commit crimes, they drive like idiots." How much time do the monitors circle over MILFs tanning naked by the poolside? This is another bad idea by the local Gestapo wannabes. It won't change a thing. Or catch that many perps. Only the stupid street punks. Will this be the military version of the aircraft or a special domestic agency version? The US military took delivery on as many aircraft out of Wichita as it could put out for the entire duration of the action in Iraq and Afghanistan. It was fast going to approach the levels of Vietnam after Johnson approved our war involvement. Piper and Cessna cranked out remote controlled models by the hundreds as they were faster to manufacture and more reliable than Predators. It could be that seeing Predators fly over East LA is disheartening to even gang bangers pulling bank robberies, home robberies, and murders. So the same banger looks up and sees a Cessna and thinks its just some future heart attack returning from his condo in Palm Springs. None of this is new if you remember the entire Branch Dividian incident. People on both sides of the conflict used the footage provided from the non-stop flyovers of the Cessnas operating the Flir equipment. It was used in the suit against the government for wrongful death that the survivors lost in court. That's because the main contention on the Flir footage is that one of the agents shot first. But the jury believed it was more likely that the Davidians set the fire accidentally from the oil lamps they had set all around the complex. I personally think the whole incident was preventable had the ATF simply worked more with the local sheriff. There is no doubt Koresh had broken the law but you simply wait until he goes into town and arrest him. But Janet Reno and Bill Clinton were able to establish several key government powers that exist to this day by pulling a direct attack on the Davidians. But Clinton did not want to exercise those powers on foreign citizens, well friends of the Saudi government so he turned down surveillance warrants on Muhammad Atta. We know how well that turned out for air travel in the USA.